Take a moment and think about every nice thing you have heard about Rio de Janeiro up till now. Before you set out for this beautiful city, just know that all the those things are not even close to the wonderfulness that waits you in Rio. Rio de Janeiro is famous for mainly the worldwide famous carnival that puts on the most colorful pictures we see throughout the year, no matter which part of the world we reside. The sandy beaches in Rio de Janeiro and the most exquisite piece of nature keep being the setting of many people’s dream holiday. If we add up the Brazilian Cuisine and the super nice attitude of its locals, Rio de Janeiro comes out of the dream and it really becomes one of the greatest spots for holiday. Despite the common misconception of Rio de Janeiro ’s being the capital of Brazil, it is not. It is the second largest city in the country with 6.3 million people, living in 4 different districts. Maybe that would be good to correct another misconception of the locals speaking Spanish. The official language of Brazil is Portuguese and the locals in Rio de Janeiro really like the travelers try speaking a bit of that. Rio de Janeiro is usually referred as the ‘sexiest city’ in the world. Of course, the festivals, the amazing weather play a crucial role in that definition. However more importantly, the soul of the city which is mixed with the passionate nature of the locals are the major things that shape up this sexiness. Get ready to explore this amazing city which offers everything you may possible want from a holiday. Get inspired by the amazing statues, museums and monuments. Eat the most delicious examples of Brazilian cuisine. Lay down in the sandy beaches and swim in the most perfect blue you may ever come across. Go out at night and dance all your stress away. Let Rio de Janeiro capture you with all the wonderfulness it has and change what you know as a wonderful holiday. Rio de Janeiro is on the south coast of Brazil, located on South America. How to get to Rio de Janeiro? There are two airports in Rio de Janeiro. Galeão - Antônio Carlos Jobim International Airport, usually known as Galeão International Airport is 20 km from the city center. There are several options of reaching to / from the airport. Santos Dumont Airport, on the other hand, usually hosts domestic flights and is located much closer to the center. This airport also provides a bunch of options to reach there. How to get around in Rio de Janeiro? As most of the metropolitans, Rio de Janeiro has got an efficient local transportation system that consists of bus, metro and taxis. Although bus is still the cheapest form of transport, you may also make use of taxis as they are not expensive and may be more convenient. Rio de Janeiro is also famous with it quick, comfortable and safe metro system. It covers the city to north to south and during the festival times it operates 24 hours. You can find a map and route planner on Metrô Rio’s official website. Rio de Janeiro is actually one of the cities in the world that welcomes you with another attraction almost at every corner. After a time, you may feel tired of trying and seeing so many different things but I guarantee that it is worth it. 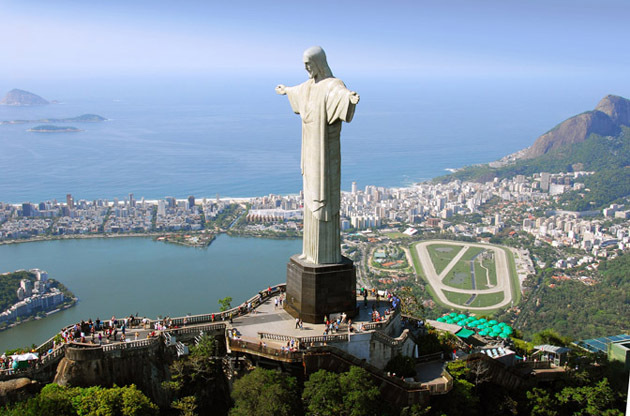 Of course Cristo Redentor, the giant Jesus statue, located in Parque Nacional da Tijuca is on the top of the list. Pão de Açúcar, Sugar Loaf Mountains is another must see place in Rio de Janeiro. Lagoa Rodrigo de Freitas is one of a kind lagoon, on the south zone of the city. If you would like to see where the magical football matches take place in Rio de Janeiro, then you can head to Maracanã. If you would like to see some museums, Rio de Janeiro offers a quite good selection of them, too. Museu Histórico Nacional, Museu Nacional de Belas Artes and Museu do Carnaval deserve some of your time. You will come across bunch of places to eat no matter which part of the city you go. However, please give a try to barzhinhos de praia, the beach bars, botecos, the little bars that usually serve fried food. These are the typical Brazilian dining. The beach areas, especially Ipanema and Leblon have got many good restaurants as well. You know, I am not even going to mention how amazing the night life is in Rio de Janeiro. You are in the right place to try out some salsa and drink Caipirinha. Don’t miss out the chance and make sure you stop by the Lapa neighbourhood to see the real partying. You can also find some of the most enjoyable parties along the beach in Rio de Janeiro. In Old Downtown, you will see one of the major shopping districts in Rio de Janeiro , which is Saara. The area consists of 11 streets and offers you the possibility to find whatever you want. Zona Norte and Zona Sul have got some of the shopping malls that you are already used to see anywhere you go. The Night Market in Copacabana, the Sunday Market in Ipanema and Praça XV Flea Market are the ones you should check out if you are into flea markets and would like to buy 100% Brazilian things. Even if you are not a swim lover, you will enjoy the beaches in Rio de Janeiro. Not all of the beaches are suitable for swimming as they are still considered to be a part of the wilderness and the currents may be quite strong. Vermelha, Copacabana, Ipanema, Leblon, Barra da Tijuca are only a small part of the beaches that you may enjoy the sun while you are enjoying your drink that is made out of sugar cane. You are going to come across a bunch of tours while wandering through the streets. Especially daily trips to nearby beaches that public transportation doesn’t go may be a good idea. However, if you have more than a day, you may considering exploring places that are not that "touristy" but great in every dimension. These are all the natural wonders that makes Brazil this much different than any other country in the world. Rio de Janeiro offers more than the amazing festival to host. The city also is serving as home to countless congresses, fairs, exhibitions, tradeshows, conferences and symposiums every year. Well-equipped and centrally located venues and centers make Rio de Janeiro a perfect city for these sort of large scale international events and offers the event attendees a chance to get into the exquisite culture of the city.